Know Your Body Type FIRST!! READ THIS!! The 3 Morphs: Ecto, Endo & Meso – Which are You? Building muscle is one of the toughest processes in the world. 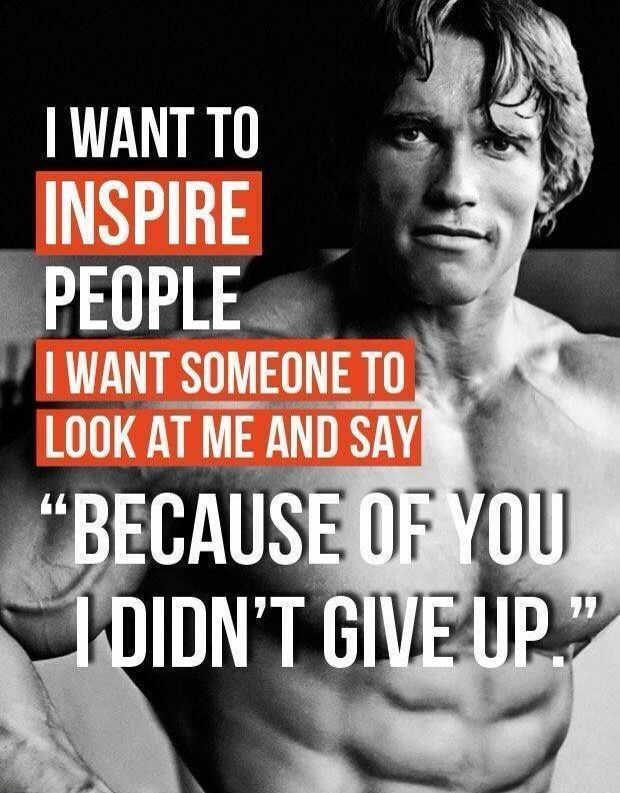 For some, it feels like climbing Everest whilst blindfolded would seemingly be easier than building muscle. Some people find it harder to build muscle than others, yet there are a select few that find it much easier. So why is it that some people can simply look in the direction of a dumbbell and gain 4 pounds of muscle, yet others spend hours in the gym each week and barely make any progress at all? Well, it all comes down to your body type. There are three bodybuilding body types. An Ectomorph is sometimes referred to as a ‘hard gainer’. 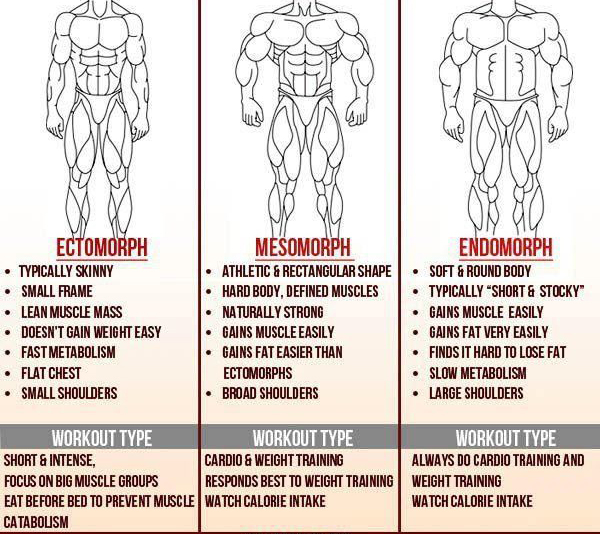 Typically an Ectomorph find it a lot harder to gain muscle mass than the other two body types that we’re going to be looking at in just a moment. If you’ve heard people talking about being ‘skinny fat’ that’s pretty-much what an ectomorph is. If you’re an Ectomorph, then you are typically tall and wiry, with long limbs and narrow joints. You have thin shoulders and very skinny wrists and ankles. Your metabolism (Metabolic rate) is through the roof, you burn calories like a match dropped in fuel. Which is why you’ll struggle to gain muscle mass. You burn calories quickly, which is why you’re so skinny. If an ectomorph does indeed want to build muscle, you should do your best to increase your caloric intakes, to train as hard and as heavy as you can, and to perhaps consider using a mass gaining supplement stack. I’m not going to push you into any particular supplement stack as there are an absolute mountain of them out there, some good, some bad, some downright useless. This bulking stack includes all of the above. And it’s 100% SAFE & LEGAL. If you’ve never taken a bulking stack before in your life, don’t worry, if you order through my link you’ll get a free bulking guide thrown in aswell. More info. If you’re Endomorph then you are normally wide and stocky. You’ll gain fat much quicker and much easier than an ectomorph, but you also build muscle easier. If you imagine a typical strongman or powerlifter physique, that’s what most endomorphs look like. Endos are normally shorter than ectos, you’ll probably have short but thick arms and legs. In particular, you’ll likely have thick and powerful quadriceps. This is why they tend to excel when it comes to powerlifting as it makes them very efficient at squatting and benching. Endomorphs gain weight easily, which comes in the form of fat and muscle. If you’re looking to build muscle and stay lean with this build, it’s recommended to watch your calories intake and perform more cardio as well as lifting. 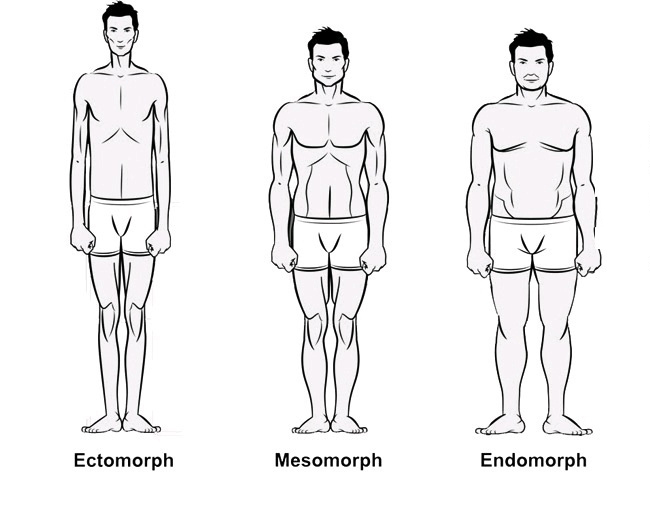 If you could choose which of the three body types you were, 99.9% of the time, you would surely choose to be a mesomorph. Mesomorphs have naturally lean and muscular physiques. Arnold Schwarzenegger was a mesomorph bodybuilder, which is why he had one of the greatest physiques to ever win the Olympia. Mesomorphs have wide shoulders and upper bodies, with narrow waists. They build muscle much easier than others and they burn fat equally as easy. They are normally stronger than most, and more athletically gifted. For the perfect physique, a healthy combination of weight training and cardio is strongly recommended.